Monte’s Venetian Room, an Italian restaurant two blocks away on Carroll Street, repainted the bridge in green, white, and red – the colors of the Italian flag around 1978. 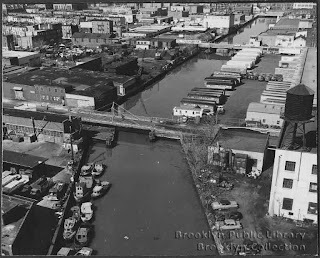 The organization Place in History assembled a group of neighborhood residents to rebuild a historic garden once located on the banks of the Gowanus Canal in October 1998. The original garden was created in 1912 at the foot of the Carroll Street Bridge. The restoration of the garden was a public project designed to celebrate the reopening of the Gowanus Pumping Station, which now flushes the Canal with clean water from New York Harbor. Place in History strives to broaden public exposure to the complex histories underlying everyday urban settings. On November 12, 1985 the Carroll Street Bridge rolled into the open position to let the tanker Jet Trader pass through the Gowanus Canal. Two days later, an inspection revealed that the bridge was plagued by serious structural problems. These included corroded steel, deck holes and overworked and failing machinery. Department of Transportation engineers did not consider the bridge sound, and therefore decided to leave it in the open position. This severed a nearly 100-year-old link between the Carroll Gardens and Park Slope communities in Brooklyn. Inadvertently, the designation of the bridge as a City landmark became an obstacle in getting funding to upgrade and repair the bridge. To be eligible for State and Federal funding for the estimated $3 million rehabilitation cost, the bridge would have had to be rebuilt to "modern" standards - with a steel deck instead of a wooden one and with other changes. These would not have been in accordance with the wishes of the Landmarks Commission that requires that the bridge retain its historic elements that include its wooden decking. In 1988, the Department of Transportation, having successfully restored the Williamsburg Bridge to full operation, decided to redesign and rebuild the Carroll Street Bridge according to original specifications. To complete the work, the City made an even bolder decision - to use primarily City workers. Accordingly, from February through September 1989, City Bridge workers raced to completely reconstructed the Carroll Street Bridge in time for its 100th birthday on September 9, 1989. From the bridge operator's house to the wooden deck and sidewalks, the bridge is a nearly exact replica of the original structure. Wherever possible, original parts were refurbished and used in the reconstruction. City Bridge workers’ restoration of the Carroll Street Bridge was completed on time and within the projected cost.